Voice of the Collector: Razor All American Football: Football Collectors- Do you care? Razor All American Football: Football Collectors- Do you care? In a few more words: Not really. 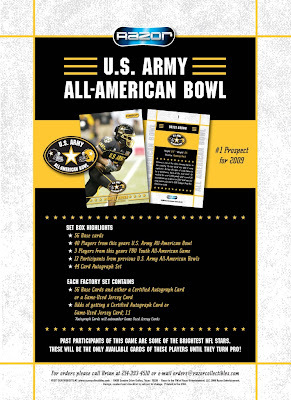 I would need to see a checklist first, and I would much rather see players in their college or pro unis, not an Army Bowl uni. I'd buy some if they were really cheap (under $15/set)... just to check them out and see who's auto/jersey I pulled. Overall though... It's not my cup of tea. yes certainly i would be interested in your collection. Tools to help you manage and eliminate debt. Use debt management to lower high interest credit card debt. I love these type of collections and I think there are enough people who are to keep this continuing. Steroids a Greater Offense than Dog Fighting? Shoeless Joe 1917 World Series Hit Ball?!?!?! Are You A Wrestling Fan? If You Ever Wanted a Tiger ProShot . . .
Topps Sells Out . . .